So my husband knows I have a new button maker. He works from home, so he got the package when it came. The good news is that I cleaned up my craft room before the button maker was delivered, so he wasn’t too mad. Buttons are really quite easy to make. Pick a pretty paper, or stamp something, or use a picture, whatever you want. Punch out the appropriate sized circle. The circle must be bigger than the finished size of the button. I have punches that coordinate with the button makers, so no guessing for me. The button is made of four pieces. The shell, which is the backing for the top of the button, a back, the pretty paper and a mylar cover. I like to make magnets, not pin backed buttons, so I have a fifth piece, a magnet set between the shell and the backing. This picture shows both my 1 inch and my 1.5 inch button makers. You can see one of the wells, and the other well is hidden under the press. In one well you layer a shell, then the pretty paper on top and the mylar on top of that. Once you have the shell and paper set, you press it in the machine. In the second well, you place the back. If you are making a magnet, you put the magnet on top of the back. The start of your button is in the machine, then you swivel around the backing, press again and out comes your button. It is so easy to to and the results are fabulous! Now I am going to go play with my new toys. Let me know if you would like me to make you any button magnets! I am very excited because I signed up for a Russian class this term. I haven’t had a Russian class in years. It is a conversation class, so it should be tons of fun. The best part is that it is a community education class, so no grades. I recently made some cards with Soviet stamps. I purchased these used postage stamps on a whim from a seller on Etsy (I really love Etsy, so much cool stuff), and when I was going through my new treasures I found several stamps with Russian icebreakers. They are beautiful stamps. So I glued them on some card stock, to make them a bit more rigid, and then added them to a blank card. Easy peasy. They turned out pretty good. Do you think I should give one to my teacher? Since there are no grades, that wouldn’t be brown nosing, would it? Ha! Please don’t tell my husband that I will soon have another button maker. I told him I would clean up my craft room last year. Now I know that last year was really only a couple of weeks ago, but I am pretty sure I told him I would clean up my room last, last year; and it is still not clean. This is a problem, because I kind of said I would clean my room before I bought the bigger button maker. Well, I do have Monday off in honor of Dr. Martin Luther King, Jr. So guess what I will be doing on Monday :-). Here is my latest card. I used the button maker to make a cute flower magnet. Then I attached it to a card. So when I send the card, it is also a little gift. Pretty cool, right! Happy 2016 to everyone! I started my year with a quick trip to Arizona to visit with my family and to host a baby shower for my niece. It was a lovely party (and the food was great; thanks to my sister!). What a great way to start a year. One of the things I am looking forward to this year is getting back into my crafts and keeping up with my blog. So, for the first week in January, I thought I would share a card-in-the-box I made the last week in December. I really like stamp sets that have corresponding die cuts. This set has the cute step through bike stamped in orange and a road bike stamped in dark purple. I used a really awesome, double sided card stock – one side with bicycles and the other side is a pretty green pattern. I added the stars and arrows just for fun. 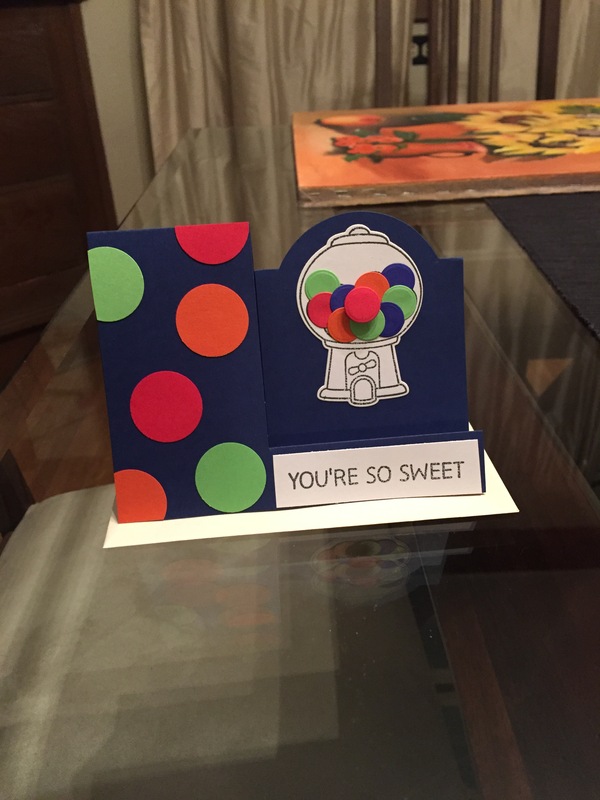 I have another cute card I made with button magnets that I will share soon. May the new year bring you and your family health and happiness! This weekend I met up with my friend and we did a bit of crafting. I brought my Sizzix Bigshot and a few dies and a bunch of Stampin’ Up! Halloween stamps. I used my new favorite die, the step up card and went to town. 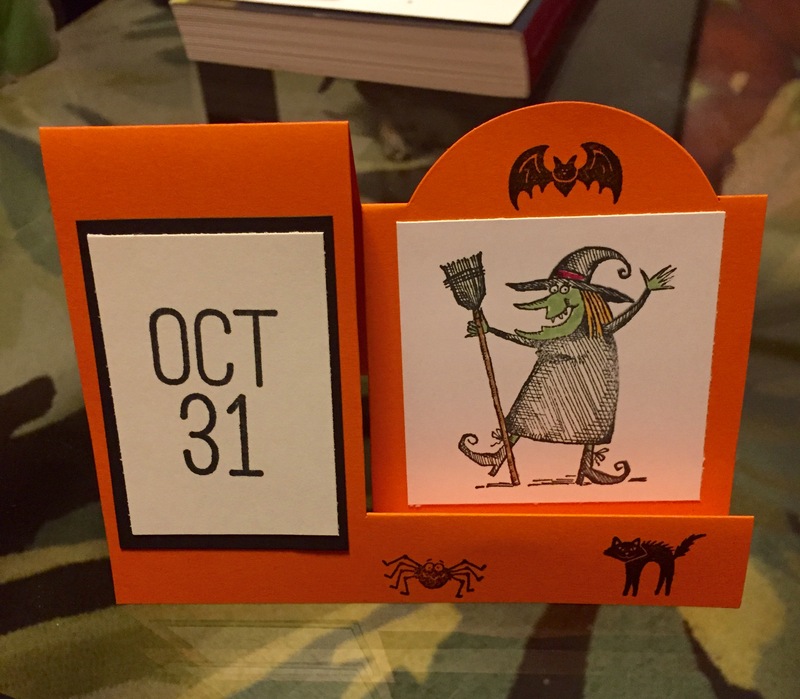 I stamped out this totally awesome witch. Tonight, I pulled out my Copic markers and added a bit of green to that witch. She looks good, doesn’t she! I don’t like the stamps on the bottom too much, so for the next one, I think I’ll skip them. This is day two of a full week of crafts. I have been neglectful of the peace and joy that crafts bring, so I am making a concentrated effort to do at least one crafty thing every day this week. So you will have to forgive the bad lighting on my pictures, because if I wait until the sun comes out, I won’t keep going. I was at Craft Warehouse a couple of weeks ago and both the cutest stamp set with corresponding dies from Lawn Fawn. What is sweeter than a gumball machine? Last weekend I bought a new Sizzix A2 sized step up card. And then I had the idea for this card. 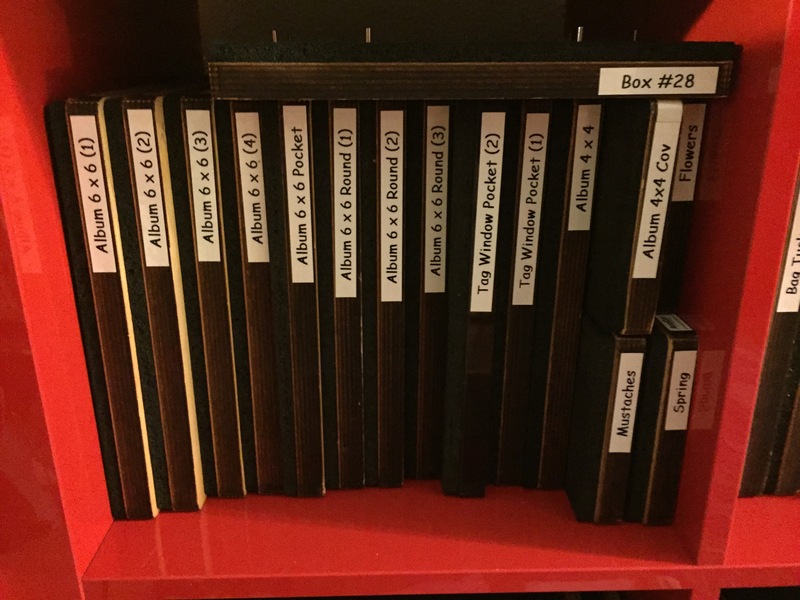 I thought you might like to see my new storage solution for my Accucut dies. These awesome cubbies are from Ikea. One cubbies filled with Accucut dies. I recently got a label maker so I could easily tell which die is which. If you need any invitations or party favors, I’m your gal!